Well, I guess you can tell by now that I've gotten really into looking at art on Etsy. So, today I've made another shopping guide. This one's for the person who loves to cook...or just loves to eat. Part of me thinks that real chefs don't use hand mixers. The other part of me knows that everyone has used a hand mixer if they've ever learned to bake. So, I like this one. It's a nice everyday object painting. I really like this painting. I like the subject matter, and I like the execution. This would be cute for kids or adults. Again, this is a nice everyday object. I love a good pyrex measuring cup. The description of this painting says it's soda and water bottles, but I'm not so sure about that. 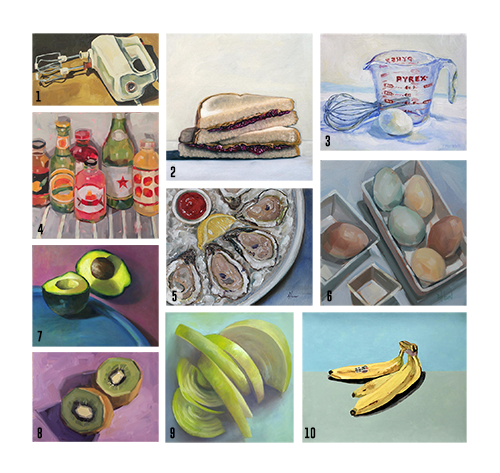 Still, I like the idea of a painting of the inside of a refrigerator. Everyone's would be different. Mine would be mostly pickles and jam...which I do not eat together. This is great for someone who lives at the beach. The texture is also really nice, and the color combination (red and yellow usually feels like McDonalds) is not one you might initially think of, which is cool. I love the color palette of this painting. I could hang this in any room...not just the kitchen. Though, I will admit that it would be a little strange in the bathroom or bedroom. Avocados are still so popular. I'm starting to wonder if they were actually a trend or if they have staying power as an ingredient for everything. I really like that this has purple, teal, and green. Very nice color combo. Don't give this to one of those people who inexplicably hates onions. For everyone else, though, it's gorgeous. This is actually the first painting I saved for this shopping list. I love everything about it. It's minimal, I love bananas, and I love the colors. So...wins all around. Well, I hope your day is as delicious as these paintings. Happy Friday!